Live satellite tracking of athletes and final results will be available at Molokai2Oahu.com. Periodic race updates, photos and live video to be posted to event’s Instagram and Facebook pages. 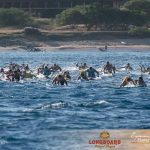 HONOLULU, HI (July 21, 2018) —The talent in the elite field for the 22nd edition of the Molokaʻi-2-Oʻahu Paddleboard World Championships (M2O), presented by Kona Brewing has the potential to produce some of the fastest crossings in race history if the Kaʻiwi Channel presents its traditionally lively blend of wind waves. 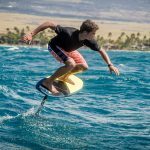 In addition to a host of athletes who are in prime competitive fitness in the prone and stand-up paddleboard (SUP) divisions, this year’s M2O will welcome a handful of racers who will test hydrofoil technology on modified SUP boards for the first time at the Molokaʻi-2-Oʻahu Paddleboard World Championships competition. A complete start list is available at Molokai2Oahu.com. M2O has released this video to complement the elite athlete announcement. Australia’s Matt Bevilacqua, 26, burst on the international paddleboarding scene in 2015 by laying down an impressive championship finish at M2O in the men’s unlimited prone race in less than optimal conditions (5:20:13). But, Bevilacqua is trending faster with each race. In 2016, he returned to set a new course record and then took a three-peat in 2017 (4:29:32), besting his previous record by 12 seconds. After big wave surfer and 10-time M2O champ Jamie Mitchell exposed the young Australian Ironman athletes to the Hawaiian race, the proceeding countrymen and women have had the Australian flag firmly planted at the finish line for more than a decade. This year is no different. Bevilacqua will be racing alongside Alex Wright, 21, and Campbell Guthrie, 19. Both men are under-19 champions in the prestigious Coolangatta Gold, an endurance surf sports competition held on Australia’s Gold Coast. M2O veteran Dean Hanmer, 31, is back after a six-year hiatus. The Australian consistently finished at the top of the pack in his previous crossings. Matt Delahunty, 18, will make his first solo attempt after winning the team competition at M2O last year. The women’s race will feature a head-to-head challenge between last year’s champion and new course record holder Harriet Brown, 28, and six-time champion Jordan Mercer, 24, who is back after missing last year’s race due to injury. Even in Mercerʻs absence, Brown’s record of 5 hours, 14 minutes, 15 seconds bested Mercer’s fastest time by more than 15 minutes, proving this matchup between two of Australia’s top Ironwomen could be extremely tight. Lizzie Welborn, 19, will be in the mix with her countrywomen after finishing second to Brown last year. The 2017 stock champion, Maddie Spencer, 21, will test the field with her move to the unlimited category. 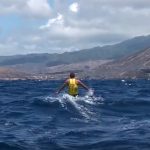 The 2018 Nutri-Grain Ironwoman Champion Brielle Cooper, 19, will attempt her first crossing of the Kaʻiwi Channel. However, first-timers luck is not uncommon. Both Bevilacqua and Mercer claimed the top positions in their first outings at M2O. The pace of this year’s men’s stock race will likely be defined by 30-year-old Stewart Mclachlan who won M2O in 2016, and 2017 when he set the current course record of 5:02:43, besting his 2016 time of 5:05:41. But, his Australian counterpart Lachie Lansdown, 22, is chasing his first M2O championship, which has proved elusive over his years of competition in the Channel of Bones. Harrison Stone, 20, rounds out the Australian bid in this race after claiming top honors in his age group last year. Hawaiʻi’s Hunter Pflueger, 19, goes solo this year after his 2017 team win. Robin Lang, 30, from the state of Virginia and Australiaʻs Heli Murray, 48, will likely lead the womenʻs stock race. 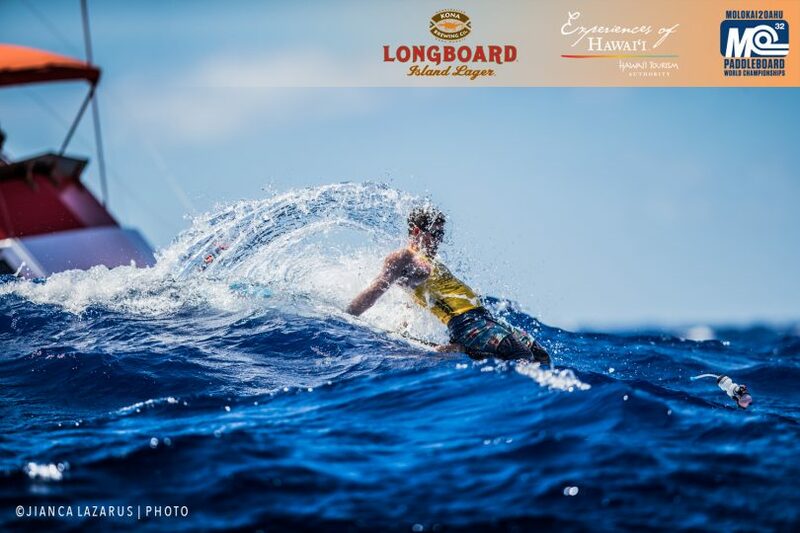 Lang finished second last year at M2O and Murray is a strong competitor in her countryʻs famous lifeguard sporting events. In 2017, the men’s unlimited SUP race saw a close battle between two M2O champions Connor Baxter from Maui and Australian Travis Grant. In the end, Grant pulled away to his third championship just a few minutes ahead of Baxter to become the first SUP athlete to break the four-hour mark in 3:59:52. Baxter who has three M2O wins at the age of 23 and Grant, 35, are back for a rematch. Also in the mix this year are returning competitors Titouan Puyo, 27, from New Caledonia who placed third in the men’s race in 2017, and one of Australia’s top SUP athletes James Casey, 26, who placed fourth. Kody Kerbox, 24, is Hawaiʻi’s bid for top honors. Kerbox, who has placed consistently in the stock division is stepping in to the unlimited race. 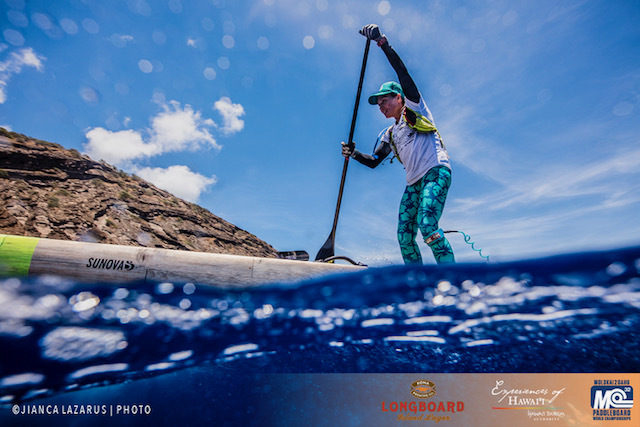 New Zealand’s Penelope Strickland, 39, is back to defend her 2017 title in the womenʻs race. After finishing second to three-time champ Sonni Honscheid, from Germany in 2016, Strickland bested former M2O champion Terrene Black from Australia last year and set a new course record of 4:52:32. Strickland is the second woman in race history to break the five-hour mark. Black, 34, is back along with Hoenscheid, 37, and Maui’s Andrea Moller, 37, who took back-to-back wins at M2O in 2010 and 2011. The men’s stock race always proves to be a lively competition. This year’s race features Josh Riccio, 29 from Florida and Niuhiti Buillard, 26 from French Polynesia. Riccio put down an impressive finish time of 4:36:45 last year and Buillard was only a few minutes slower in his 2016 win in the category, which will make this a tight match up. They will be joined by Hawaiʻi’s Mo Freitas, 21, who has placed consistently in this category and Vinnicius Martins, 22, from Brazil who finished fifth in 2017. Siri Schubert, 49, is back to defend her 2017 win in how women’s race. She will likely be challenged by Hawaiʻi’s Annie Reickert, 19, who recently won the Maui to Molokaʻi race in the stock category. 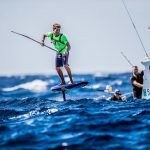 For details on the hydrofoil division race, please read this article. Founded in 1997, M2O has grown from a grassroots challenge for the legendary lifeguards of Oʻahu to the premiere event in the sport of paddleboarding. The race annually crowns world champions in the two disciplines of traditional (prone) and stand-up (SUP) paddleboarding. In 2018, a hydrofoil division was added to welcome the evolution of technology in the SUP. Connecting the islands of Molokaʻi and Oʻahu, the 32-mile race crosses the Kaʻiwi Channel, also known as the Molokaʻi Channel and Channel of Bones. Men and women from more than 20 countries will face strong currents as they navigate the fastest downwind-route over one of the most beautiful and powerful channels in the world. Top athletes can complete the crossing in less than five hours, riding mid-channel waves that crest more than 12 feet and carry paddlers hundreds of meters. M2O starts in Kepuhi Bay on the northwest shore of Molokaʻi and finishes in Maunalua Bay on the southeast shore of Oʻahu. The annual race is a deeply personal experience, challenging every paddlers’ physical and mental endurance. Every finisher experiences an individual championship. M2O is proudly supported by Kona Brewing Company, Hawaiʻi Tourism Authority, Duke’s Waikiki, Oakley, Patagonia, Rogue, Futures Fins, Blue Rush, Amavara, Salonpas, Greenlayer, Outrigger Hotels, Enterprise, Stand Up Paddle Magazine, Ocean Paddler, DotVison, Aqua Pro Fitness, XO Activewear Paddle League and Fin Film Company. 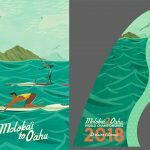 Hawai’i Artist Nick Kuchar’s Vintage Surf-Inspired Work for the 2018 Moloka’i-2-O’ahu Paddleboard World Championships Influences New Design by Futures Fins.